Here's a deliciously updated version of an old-fashioned homemade cookie-cake treat! Whoopie Pies are gaining popularity all across this the country. What was once a rather plain and simple homemade treat found only in Maine and the Pennsylvania Amish Country is sweeping the nation. Whoopie Pies are showing up in specialty shops, bakeries and gourmet catalogs. Recipes for whoopie pies have been spotted in Everyday with Rachael Ray magazine, on Martha Stewart's website and in various food blogs. We've gathered our favorite recipes for pumpkin whoopie pies here for you. If you love pumpkin and are always on the lookout for new ways to use pumpkin each season, we hope you find these a fun and tasty addition to your pumpkin desserts repertoire. I personally can't get enough pumpkin so love to whip up a batch of these delicious treats several times a year. 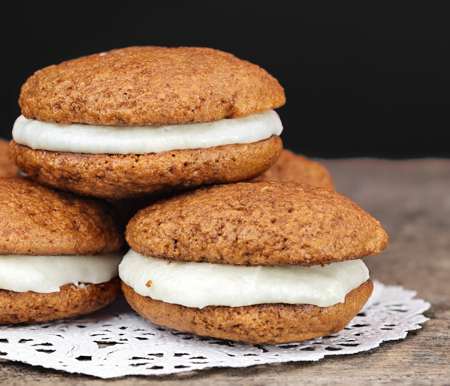 We've got two great pumpkin whoopie pie recipes for you. The first is for homemade pumpkin whoopie pies from scratch and the second begins with a boxed cake mix for the taste of homemade, but easier. These pumpkin whoopie pies call for a lot of spice and we think they are great. If you prefer your pumpkin flavored desserts with less spice, feel free to cut back the quantities to a level that suits you. This whoopie pies recipe is easy too. Since it calls for oil, instead of butter the batter can be stirred together without the aid of an electric mixer. Another important tip is to use chilled pumpkin puree which will keep the whoopie pies from spreading too much as they bake. Preheat oven to 350F degrees. Line two baking sheets with parchment paper or a nonstick baking mat and set aside. In a large bowl, whisk together the flour, salt, baking powder, baking soda, cinnamon, ginger, and cloves; set aside. In another large bowl, whisk together the brown sugar and oil until well blended. Add the pumpkin puree and whisk until thoroughly combined. Add the eggs and vanilla and whisk until well combined. Pour the flour mixture over the pumpkin mixture and whisk until fully incorporated. Using a small ice-cream scoop (about 1 2/3-inches in diameter) or 2 tablespoons, drop tablespoonful mounds of the dough onto the prepared cookie sheets, spacing them about 2 inches apart. Bake 1 sheet at a time (make sure to use cooled sheet for the next batch) until the mounds are puffed and a toothpick inserted in the center of 1 mound comes out clean, about 15 minutes. Let cool completely on pan. This cream cheese filling can be made up to one day ahead and then covered and refrigerated. Remove from the refrigerator and let stand at room temperature until it can be spread easily. Sift the confectioner' sugar into a medium-size bowl or large piece of waxed paper; set aside. In a large bowl beat the butter with an electric mixer on medium-high speed until smooth. Add cream cheese and beat until well blended. Add confectioners' sugar and vanilla, beat just until smooth. Arrange half of the cooled pumpkin cookie cakes, flat side up, on a work surface. Mound about 1 1/2 tablespoons filling in the center of each. Top with the remaining cookie cakes, rounded side up, and press gently on top until the filling spreads to the edges. Refrigerate until the filling is firm, about 1 hour, or until ready to serve. This recipe makes about 12 to 16 Pumpkin Whoopie Pies. Recipe Source: Martha Stewart website. Yummy pumpkin cookie cakes filled with a delectable marshmallow spice cream filling. In a large mixing bowl beat the butter and pumpkin with an electric mixer on medium speed until smooth. Add all the remaining ingredients and beat on low speed until combined and then on medium speed for another minute. Using a small ice-cream scoop (about 1 2/3-inches in diameter) or 2 tablespoons, drop tablespoonful mounds of the dough onto the prepared cookie sheets, spacing them about 3 inches apart. Bake 1 sheet at a time (make sure to use cooled sheet for the next batch) until the mounds are puffed and a toothpick inserted in the center of 1 mound comes out clean, about 15 minutes. Transfer the cookie sheet to a rack and let cool for 5 minutes. Using a spatula, lift the cookie cakes from the sheet onto a rack and let cool completely. This marshmallow-spice filling can be made up to 2 hours ahead and then covered and refrigerated. Remove from the refrigerator and let stand at room temperature until it can be spread easily. Sift the confectioners' sugar into a medium-size bowl or large piece of waxed paper and set aside. Add confectioners' sugar and beat just until smooth. Add the marshmallow cream, vanilla, and spices and beat just until combined. Prefer traditional whoopie pies made with chocolate cookie cakes and creamy vanilla filling?